It’s hard to imagine anyone more committed to sourcing local and North Carolina-produced ingredients than Kevin and Ngiare Hubbard, husband and wife proprietors of Patrick Jane’s Gourmet Pizza at the Shoppes of Kildaire in Cary. The restaurant’s comfortable, contemporary space offers a fresh alternative to typical pizza joints. Certified organic flour for the pizza crust comes from Lindley Farms in Graham. Herbs are provided by Fuquay-Varina’s Green Bee Farms. Goat Lady Dairy in Climax furnishes the goat cheese, and First Hand Foods in Durham supplies antibiotic- and hormone-free pork and beef. The Hubbards even grow basil, rosemary and mint onsite. 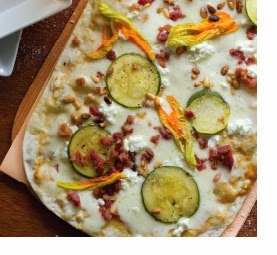 Among the restaurant's eclectic menu selections is zucchini flower pizza, which features a roasted garlic base with aged mozzarella, goat cheese, zucchini, zucchini flowers and pine nuts. Deliciously robust asparagus pizza comprises pecorino Romano cheese topped with fresh asparagus, ricotta and lemon saffron aioli. My favorite pie is the savory-and-sweet bacon and blueberry jam. 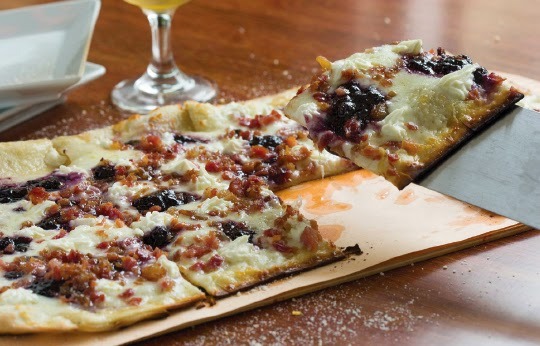 Created with a mascarpone cheese base, it’s topped with aged mozzarella, house-made blueberry preserves, bacon and dollops of ricotta cheese. Pizzas take approximately five minutes to cook, and the addictive crust is always crispy. Gluten-free and vegan pies are also available. Polo Ralph Lauren Pas Cher cheap asked. sale Ralph Lauren Soldes cheap just heard words of love are still moving, Polo Ralph Lauren Pas Cher then the brain is certainly a hot quickly said, I http://www.pompiers-plouay.fr will forever love you Polo Ralph Lauren Pas Cher alone. But then just finished sale Polo Ralph Lauren Pas Cher secretly fierce slap fan myself, I am the grass.